Over the years, three things have stood out in my musical persona: one is the fact that I am mostly self-taught, another is that I have almost always been leader of my own groups, and yet another is my penchant for mixing the music of other world cultures with jazz. Back in the 1950s, Amy Duncan was a little country girl in Connecticut who loved jazz and whose big dream was to be “the world’s greatest jazz pianist.” Well, that never happened, but she did work very hard at the piano and began to play professionally at age 15. Amy went to college at Boston University, but dropped out after a year and a half and spent many years playing jazz in small groups around the city. 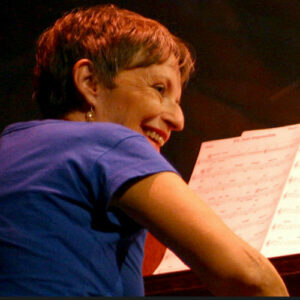 Later on she moved to New York where she formed her 10-piece band Brass Tacks in 1985 as a vehicle for her music writing. Somewhere along the way she managed to squeeze in 12 years as pop music critic for The Christian Science Monitor, raise two daughters, and then, because of her love for Brazilian music and culture, moved to Rio de Janeiro in the 90s. Amy spent five years parading as a drummer in Rio’s famous Carnival, and then was finally able to put together the Rio version of Brass Tacks. They played in clubs and theaters in Rio and toured cultural centers in São Paulo. In 2002 they recorded their first CD, “My Joy,” which consists entirely of Amy’s compositions and arrangements. Amy has also written and published her autobiography, Getting Down to Brass Tacks – My Adventures in the World of Jazz, Rio, and Beyond. Amy Duncan’s autobiography, Getting Down to Brass Tacks – My Adventures in the World of Jazz, Rio, and Beyond, has been called a “page- turner” —it’s a sometimes wild and hairy, sometimes poignant and moving, often humorous and always honest and gritty journey through her life. The Brass Tacks recording, with ten compositions and arrangements by its leader, is one of the most pleasant surprises to appear in Brazil in the area of jazz during recent years. Here's wishing you more inspiration! Your work is wonderful! I listen to it while I'm working, and it has become part of the sound track for my paintings! Roach Motel is awesome! Here's some of the dialogue going on in my mind as I listened: That's a cool motif...wow....Ah Roaches!! I see roaches scurrying 'round my basement apt. back in Miami Beach as I turned on the kitchen light in the middle of the night!! AAHHHHHHHH!!! Too many to try and step on them, Who am I listening to? Zawinul. That's Joe Zawinul. Weather Report. Awesome Joe!!! No wait that's Amy....!! Amy is baaaaad!!! What was she thinking when she wrote this piece??? That's just pure inspiration from the cosmos. That song is literally a trip! Brilliant! With Amy's music, it's not hard to explain why I'm so captivated by it. She has brought together two different worlds?jazz and samba?with magical chemistry. She is the outgrowth of the unique experience of her life...with a superb talent. I LOVE your CD and am so impressed you could run off to South America and put together a re-creation of your New York band. I bet if you moved to Alaska you could get a bunch of Eskimos and polar bears together and do the same thing?or Hawaii and get natives and dolphins and sea turtles to do it there. Cosmic Puzzle is such a fun composition, so many pieces that would individually travel somewhere on their own at different times, but each would come home to the family harmony for a few bars. The puzzle pieces all fit together. The band is daring in its repertoire, playing all original tunes written and arranged by Ms. Duncan. It's so difficult to hold an audience's attention with the program made up totally of unfamiliar tunes that most leaders don't take the risk. Duncan does -- and succeeds. Duncan, a small woman whose hands can barely stretch an octave ... is a cooking, inventive pianist.